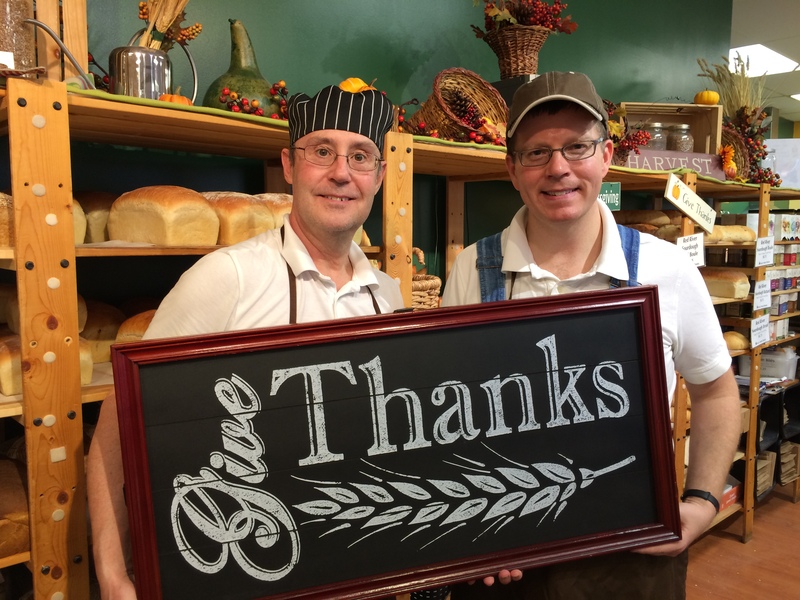 Dakota Harvest Bakers retail storefront is now closed after more than 10 amazing years of service to the Grand Forks community. It has truly been a pleasure providing our fresh-baked hospitality to our customers, and we hope that we have served you well. It was back in May of 2006 that George Kelley and Paul Holje opened Dakota Harvest, with the goal of bringing something special to our downtown. Located in the bountiful heart of the Northland, we set the goal of bringing a new farm-to-table experience to the community. Whether it’s flour from the North Dakota Mill, sugar from American Crystal, milk from Thief River Falls, eggs from Fosston, honey from Larimore, or produce from Park River and the Grand Forks Farmers’ Market, we set and achieved the goal of sourcing 80% of our ingredients from within 200 miles of the bakery. This commitment to local quality was reflected in everything we made. The highest quality food drove our vision, but none of this would have been possible without the dedication and commitment of our staff. Skilled artisan bakers and friendly hosts crafted our delectable treats and then served them with a sense of pride and welcome. It’s because of our focus on these remarkable employees that we were called “Dakota Harvest Bakers” and not “Dakota Harvest Bakery”. The people here were always the focus, and not just the building. We will forever be grateful to the co-workers who became friends, and helped us to make all of this possible. But, of course, none of this could have happened without the tremendous response from the greater Grand Forks community. Our loyal customers recognized what we were doing and supported us as we grew. The hospitality of our bakers was returned by the welcome that we felt from all the happy faces gracing our store. Dakota Harvest Bakers worked hard to be a positive contributor to our city, whether it be donating communion loaves to any church asking for bread to supporting the local arts scene to providing food to community food pantries to working with local social support organizations to helping the Circle of Friends Humane Society. All told, we gave back nearly $200,000 in funds, food, and in-kind donations over the past ten years. We are proud to have been so involved in the support and success of our community. But, as the saying goes, all good things must come to an end. We are now off to find new adventures and new projects. We will forever be grateful to our amazing staff, our dedicated customers, and the embrace of our community. We look forward to growing and sharing the story of Dakota Harvest in the years to come.